Conducting a mediocre rehearsal sets the stage for a mediocre performance. A skilled orchestra or choir conductor knows that creating an excellent performance begins with creating an excellent rehearsal – every note has integrity. 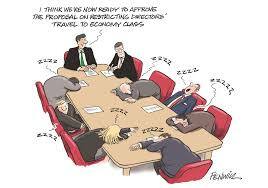 Corporate leaders conduct boring, unproductive meetings and expect excellent results despite the poor rehearsal. There is not difference in a corporate meeting or a symphony rehearsal. It’s Hugh leadership principle #3: Rehearse for Success. This principle is true for all we do in leadership! When the conductor steps on the podium to conduct a meeting (rehearsal) with an orchestra, he or she is thoroughly prepared for success. Not only are the outcomes in mind, but also the process to get there has been completely planned. With Hugh’s 10 tips for conduction high performance meetings you will equipped to transform your corporate culture to the DNA of excellence that is embedded in every great symphony orchestra around the world. 1.Clearly state the purpose for the meeting. Don’t hold a meeting unless there is a reason. Know why you are holding a meeting and tell others why. Give a definition of the expected output of the meeting. Never, every use an agenda for a meeting! “Agenda” implies activity. “Deliverables” implies and drives for results. Articulate the meeting objectives as clearly stated deliverables or some other term that communicates completion of specific objectives. Explain what will happen and when it will happen in this meeting. Help people understand where the meeting is going and how the group will bet there. This will help each participant be fully present for each part of the meeting and to trust the process. Explain what type of discussion is needed (brainstorming, sorting, prioritizing, etc.) at each point in the meeting and define how those concepts will work. Explain how decisions will be made. Begin with the deliverables, that is, know what you want to walk away with at the end of the meeting. Express the deliverables using specific, measurable outcomes. When planning the meeting, allow twice the meeting time for your planning process. In order to get the best results a commitment to the best planning is necessary. Yes, that’s a 2:1 ratio. Spend twice the time planning the meeting to get the best results from your team. You have good people. Give them the context for getting their best thinking skills and for making the best decisions. Here’s another important planning principle: only plan for 65% of the available time. Some items will take more time than planned. Be efficient with your time and respect the time of others! You will get their best participation. Outline every part of the meeting in your planning guide. Define how much time it will take to introduce the deliverables and give an overview of the meeting. Define how much time it will take to brainstorm, sort and refine. Do not leave out any part of the process. Prepare visuals for the meeting. Record the input of the group on chart pads, storyboard cards, white boards or some other media that everyone can constantly review as they make decisions. Define where the group input is needed and where it is not. Explain the difference. One person must control the flow of the meeting. One person must facilitate to insure that the group stays on task and nobody dominates all the discussions or decisions. The facilitator also ensures that the meeting addresses all the deliverables as promised and involves everyone in the process. Know how long the meeting will take, pace the meeting and end on time as promised. Keep faith with the participants. Begin on the exact time specified even if everyone is not present. Do not penalize those who have arrived on time. If you communicate that you are not keeping your word as a leader with something as simple as a starting time, then how will your work be trusted in more important matters. Assign a priority for items in the session. Know which items to drop or postpone if the meeting is more complex than expected and begins to take longer than planned. Consider announcing “exact” starting times (not 3:00, but 3:02). Try it, it works! If people have been asked or required to attend a meeting, then expect them to participate. Participating will validate each person’s part in the process and ultimately to the outcome. This principle will give each person ownership of the outcome. Give everyone an opportunity to “opt-in” for assignments then they own it. Writing down ideas gives validation to the ideas contributed. A visual record will also remind the group of the data generated keeping data visible for making better decisions. Record ideas and concepts exactly as stated. Do not interpret or put in your “two cents worth.” Record first, judge or sort later – this is especially important when the material is sensitive, challenging or complex. If a participant hijacks the meeting, take it back, gently. Do not allow any participant to ramble or give speeches that are unnecessary or lengthy. The facilitator must remain in control of the process and take it back from time to time. If actions are needed, assign responsibility and a completion date for each item. Good ideas will only materialize into results when they are a part of an action plan. Agree on the next step(s) or next meeting date before ending the meeting. As people are invited to attend the meeting they should be instructed to bring their calendars. This is one reason why. Affirm the participants and their contributions. Review the list of deliverables to validate your success. Celebrate! This session is about empowering teams. It’s the first one in a series of sessions I am going to call “Stupid Things that Leaders Do that Compromise Progress, Compromise Results, and Ultimately Compromise Our Income and Our Profits.” I want to give you my ten tips in this session. These ten tips will empower you to engage and motivate your team so they are now a higher performing team. As you know, I spent 40 years working as a musical conductor. I never saw a musical conductor use an agenda for a rehearsal. We are going to talk about format. We are going to talk about strategies. We are going to talk about reverse paradigms. The number one reverse paradigm is never use an agenda for a meeting. It’s the absolute death of productivity. I am going to talk about that as we go down Hugh’s ten tips for conducting power-packed meetings. If you find one thing in this list and you can implement one thing, it will make a difference in your team performance. People hate meetings. 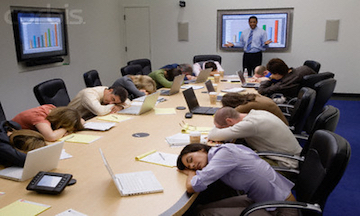 When I am presenting workshops or keynotes, I will ask people to weigh in by answering the question, “How many people have attended a boring, unproductive meeting?” People will raise their hands and laugh about it. Then I ask, “How many people actually conducted one of those meetings? You’ve attended one. Have you also conducted one?” Fewer people’s hands go up because fewer people are willing to admit it. We all lead bad meetings. We can all improve our team engagement. The #1 team killer is bad, unproductive, poor meetings. It is a downer. We think we know how to run meetings until we start doing it. We ask people, “Could we do things better?” People would say, “Yes.” So we want to say, “Yes, I know how to run meetings. It’s a non-starter. I will do it. Thank you very much.” What are you thinking? You are probably going to fly a plane and you don’t need to take flying lessons. Let me get into the meat of this. Hugh’s ten tips. I have run meetings for over 30 years. People hire me to run meetings. I never use an agenda. Point #1 is purpose. You need to have a purpose for this meeting. Otherwise, don’t have a meeting. Outline what you are going to do in the meeting, not activity, but results. You are going to specify deliverables. It is a very different paradigm for agenda. Agenda is activity. Deliverables are results. The results are the impact of what you have done. We start out by defining our deliverables for this session. You send them 24-48 hours ahead, and they have begun thinking about it. They are engaged from the point they receive your reminder. I even go as far as not to call them meetings; I call them a planning session, an evaluating session, a brainstorming session. See what I’m doing? The purpose of the meeting is also what kind of meeting it is. We call people to a meeting, and we don’t tell them what kind of meeting it is. Are we being productive? Yes. Are we together? Yes. We are using our best thinking skills. We don’t micro-manage people, and we don’t tell people what to do. Leaders ask good questions. Leaders ask others on the team to step up to their level of leadership. Transformational leadership is about building leaders on teams. At the core of that is what we do together, this thing we call a meeting. It is the most dysfunctional thing I know. In any organization, your purpose is what you are going to accomplish. Define the purpose of this session. Send it out to people, and commit to this set of deliverables. 1) Never ever use an agenda. Specify your outcomes. Send it to people ahead of time. They come fully ready to think about those results. The number one word is purpose. What is the purpose of this gathering? 2) Review. Look at what you said you will do. You sent it out ahead of time, you called people to the meeting, you look at what you said you were going to do, so review that. Let me give you an example of a deliverable as opposed to an agenda item. An agenda item would be an activity. For instance, we are going to talk about marketing. Okay. So what? A deliverable would be we are going to define the top five marketing strategies that will increase our sales by 25% and our bottom-line profit by 30% in the next twelve months. A deliverable is a specific, quantifiable outcome. We look at that deliverable, and we say, “We are going to get there by brainstorming, sorting the options, grouping the options, looking at priorities, and then developing a plan from our brainstorming.” We have let people know we are going to have a very specific process, and we let them know that we are going to walk out of here accomplishing this, this, and this. I easily think three deliverables are plenty; it depends on how much work needs to go into each of these modules. This leads us to #3. Point #1 is purpose. Point #2 is review. Point #3 is plan. Plan from the back forwards. Covey said in his Seven Habits of Highly Successful People to begin with the end in mind. You define what you are going to walk away with, which you have done with your deliverables. Now you plan backwards. How long will it take you to do the brainstorming on these options for the five top marketing strategies? You will brainstorm more. You will cluster them, group them, decide that these ideas go together, and get a much stronger idea. You think, We have to brainstorm, cluster them, decide which ones are doable, assign a priority to them, and then we have to assign a champion to them. Each one of those takes a bit of time. So it’s important for you to think about how much time it’s going to take. You plan the meeting backwards. In purpose, it was use deliverables, not an agenda. #2 is look at the process and define what kind of meeting it is. #3 is plan. Plan only 2/3 of the time. For a 90-minute meeting, you plan 60 minutes of activity because it will take longer. If you end up earlier, you dismiss earlier, then you accomplish your deliverables earlier and nobody will be angry. People will be happy. Some people might be uncomfortable because they are used to the paradigm of work expanding to fill the time alive. I don’t subscribe to that. Define the outcome. Plan from the back forwards. A musical conductor spends two hours for every hour of rehearsal planning. Why? Because you have really good people, you are probably paying them money, or they are very high-level volunteers in your charity or church, but they are important people. You have important work. If you don’t plan it, you won’t get the best results. Honor the people. Honor the vision. Honor the organization. Do your duty, and plan. #4 is lead the meeting. You have said what you are going to do. Here is another tip. Say what you’re not going to do. If you are going to define the top five marketing strategies, what you can’t do is define the details of each one. You will define a strategy. You will assign a champion. You will set a deadline for them to come back the following week, whenever you are going to meet again, with the details of the plan for the rest of the group to massage. We need a plan. We don’t do it in one sitting. We define those strategies, and then we say that we are not going to get into the weeds because groups will get into the weeds. So lead the meeting. Make sure that you always keep people on track toward the deliverables on the topic. Purpose is one. Review is two. Plan is three. Lead the meeting is four. #5 is begin on time. When you say you are going to start, it is important that you start. How many times have we been to meetings where somebody is missing and the leader says, “We are going to wait for so-and-so here.” We are going to wait for somebody who has not honored us by being on time and disregard those people who were on time? No. Start on time. Here is a tip for this section. If you have a meeting around 2 pm and it goes to 3:30, announce that the meeting will start at 2:01. It’s the 2:01 meeting. You’ve gone away from a general time of 2:00 into a specific time of 2:01. People will show up just to see if you are going to do it. Ah, they are going to dare you. You say it is going to go from 2:01 to 3:27. You have planned it, and you know you can get it done. Your job is to start and end on time. Be prompt. Encourage promptness. You actually are in this process teaching leaders to function at a higher level. Every musical ensemble in the world, the better they are, the more they rehearse for every single performance. It’s key that we stay at the edge of our game. It’s key that we in music develop ensemble. My company SynerVision is the combination of the words “synergy” and “vision.” We develop synergy through having this common vision. We as leaders create the space for people to build as an ensemble of excellence on our committee, our board, our staff. We empower people because we honor them as people, and we respect them and their time. Even if we are paying them, we want to give them something worthy to do rather than respecting everybody’s time. So the third one is start on time and end on time; do not set meetings at the hour or the half hour. #6 is prompt. You have everyone there. You have selected people on the team because they have expertise, they have perspective, they have responsibility. There is a reason these people are sitting in these seats around the table. Make sure everybody participates in the variety of ways that can be done. Those people who are like me can think on top of their brain, who are extroverts and are very outgoing, will give you their opinion. Other people are deep thinkers; they are going to think about it before they run their mouth. They will consider the options. They will listen very carefully to what is going on. It’s a huge mistake not to ask that person to weigh on on a perspective, an idea, a decision. We want to make sure everybody contributes so everybody feels honored and creates the strategy, the plan, and the idea. Everybody is a part of it, and that way, everybody owns it. You really can’t afford for anybody to sit out and say, “I didn’t weigh in on that. It wasn’t my idea. It was somebody else’s idea.” That is not very effective leadership, and it certainly is not leadership you want to support. Think of the triangle player in the percussion section in the back of the orchestra. There could be a score where they stand there and count 137 bars of rest, and then they play at precisely the correct time because they were paying attention. When they play, it has impact because you can hear it over the rest of the orchestra. Everybody plays a role. Everybody has an important note to play. Your job as leader is to make sure you bring out the best in everybody, which means you don’t talk too much. You have two ears and one mouth. I think God’s wisdom was evident there. #7 is to create norms. We all know how it should go; we all know how things ought to be. We need to decide together how we are going to work together to find norms, to find a team covenant. We have a project team. We are going to be working three months on a project. How will we work together? You ask people to think about when you were in another group that didn’t work so well. What will you do to make sure this group is a high-functioning team? You ask people to write a statement down on a piece of paper and turn it in. I promise are the first two words. What do you promise? You will get things like: I promise to be on time; I promise to listen to others before expressing my opinion; I promise not to criticize until I understand the intent; I promise not to have separate meetings about what we do with the group and try to create triangles with what we have come together as the plan. Things like that will surface. In conversation, we transform the “I promise” statements to the “We promise” statements. You create this culture of high-performing individuals, and we are really creating policy and procedure principles that guide our decision-making and our functioning. It really creates an open and honest engagement. #7 is norms. It is defining what you promise. Ask them to do it. They will hold you accountable, which is a good thing. They will hold each other accountable. That way, the leader no longer has to be the mommy or the daddy to hold everybody accountable. The group will do it itself, and it starts right here. #8 is record. We remember 10% of what we hear, I understand from educators. We remember 20% of what we see. When you combine the two, it raises it above 65% at least. If there is a kinesthetic, experiential part of it, it raises the learning much higher. We say things, and we expect people to remember things. But they don’t. It’s 10% retention. We write it up there, and they might remember, as it is 20%. Put them together. Talk about it, and write it. I use storyboards, a report board with a sticky surface and paper. We look at the board. We talk, we write, we experience each other, and we have conversations. We actually integrate the planning and the performance piece, just like a musical rehearsal. We build the team during the planning process. We are actually shaping the DNA of the culture. I call this the new architecture of engagement. How do we raise the bar? We model new behavior, and we ask people to step in the space of high functioning. We stop and correct things when they need to be corrected without attacking people. Direct, honest communication. If somebody is going to the weeds and not honoring the no-details-off-limits for this, we’re defining what we’re going to do and what we’re not going to do. What we do is deliverables. What we don’t do is off limits. What we don’t do this time we might do next time or some subsequent session where we come together. Record the group’s information. It is especially important when you are brainstorming to record it exactly as stated. Don’t interpret it; record it exactly as stated. Tell people that we will have a discernment time because a lot of ideas that go up won’t be good or useful. There may be good ideas that lead to a useful idea. Record it where people can see. #9 is control. We want to stay in control of the meeting. There will be people around the table who have not spent time planning and don’t understand how much you are going to get done in a short period of time, and they will say, “We should be doing this.” No, this is my meeting. This is what we are doing. Thank you for the idea. We are staying on track with this. The tip is: We agree from the beginning on the deliverables and tell people you are going to keep everyone focused on these deliverables and the process you have outlined. The very last thing you will do is a communication plan and an evaluation of the session. They have no way how much time you have spent to make sure they save time. Just say, “We will have a chance to evaluate at the end. If it’s a good idea, we will consider it next time.” Be sure to thank them for their idea. As conductors, we never interrupt another conductor. Even if we think we have a better idea, we never do that. You want to build that sort of etiquette into your team and build an accountability where you can talk about it afterwards, not during this momentum and not having to explain your process to someone who was not there and did not put in the hours you did to plan. Let people know that there will be a sorting period, a brainstorm, and a time to throw out the bad ideas later. Then they will feel free to throw up really stupid ideas, which will lead you to really good ideas. Non-linear thinking is creative thinking. The tip here is don’t get anxious. Don’t raise your voice. Confront means with your front. Speak to the person with respect. Thank them and tell them what they are doing instead. “This is a process I have designed.” Use the word “design.” You have designed planning sessions. You have designed the brainstorming session. Last one is accountability. We have all been to meetings where everyone has great ideas, and no one ever says, “Who is going to do it?” The assumption there is you are going to do it. No. You are not going to do it. As a matter of fact, when you do an action plan, I always have an action plan up and ready. It says, “Action Item.” In the first column is what you do: to develop, to create, to implement, to plan, to define. Then the next column is: Who is the champion? Who will do it? It’s the responsible person. Third column is when will they do it? Here is where we begin teaching people that we don’t do all the work in the meetings. We make group decisions. We evaluate. We look at the work we have done. We plan the next set of deliverables. What you are planning now is the deliverables for the next session. What are the deliverables for attracting more clients with our five strategies for marketing? One of them could be to define the details for each of those five. You can have five champions who are supposed to come back with the details of how they will be implemented. When they come back and report, each of them will report, and everybody on the team will decide to make a few changes, which means they have owned it. Then we start eliminating the silos of different departments of different job descriptions. Don’t adjourn the meeting without having a set of deliverables or an action plan. What is the action plan? Who is the champion? When is it going to be done? That is the deliverables for the meeting from the next meeting. Also, your accountability communication plan. Is there somebody not sitting in the room who needs to know about one of our decisions?? What is the specific message? Who needs to hear the message? Who will tell them? It is very critical to think about people who are not in the room. There are things they need to know. We take this for granted, and then people say, “I wish I had only known.” Being intentional about your communication plan will save a lot of people a lot of time and preserve relationships. Finally, evaluation. Let’s talk about today’s session. Let’s just grab a few ideas. Your last five minutes should be a debrief. What are some things that went well? Write those down because you don’t want to change any of those; those are things you want to keep. Second column is: What needs changing? What do we need to do differently? What do we need to stop doing? Third column: new things to consider. What did we not do that we maybe ought to do? This is Hugh Ballou. Conducting power-packed meetings will change the productivity of your team and your culture. You can do this week after week. It gives you the flash meetings to check on if people did what they said they were going to do. The other big dysfunction in companies is the annual evaluation. We are going to wait a year before we tell people how they are doing? With this scenario, every time you come together, you know how people are doing. You as the leader have the chance to mentor people, to coach them into a higher-performing functionality or standard. There is a question and answer thing on your page. You want to be sure that you ask questions if there are any. Here is one: “Hey, Joe, how can I get those boards?” Get those at any office supply. Elmer’s has these black report boards made of foam core and are tri-fold. Get the black board, take it outside, and get some repositionable spray mount. Spray it horizontally, let it dry, spray it diagonally, let it dry. Use regular printer paper and cut it in half. Give people big markers. There are chart pad markers you can get at the office supply. Chart pad markers do not bleed through. They are big, they are bold, they can be printed on by anyone. It is an active involved process where people are working together. Get those supplies. How can I find out more? You can go to synervision.us. There is a whole report there on conducting power-packed meetings. This is Hugh Ballou, the transformational leadership strategist saying thank you for joining me. I hope you have power-packed meetings.